Depends on what anyone's willing to pay. 'Personaly' I'd really want a complete kit. Most of the major parts are missing by the looks of it. The Dizzy is missing from that list aswell as the Turbo, the plenum and a few other small things, so I'd say around Â£50. Just put a kit together yourself, might be easier in the longrun. From the above list I could get all the bits easy but what carb do you use and what mods need done to it? 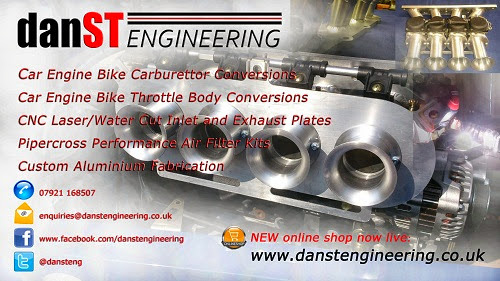 ideally, you want a leanburn engine with a rejetted dft carb. The only useful thing on that list seems to be the plenum and teh 'some' pipes. i wouldn't pay more than Â£50 for it. two key words there are *think* and *remember* both of which should be treated as wrong! In that case, I'd revise my price to Â£75. As for the carb and mods. It's all in the TT manual, which is available for download off my site. I'm surprised you didn't know Dave. It's not like I've never mentioned it before! i used a dmtr tt carb and got just under 200bhp@17psi, 170@12psi, and it still had more in it. not included = down pipe, fuelin. sorry it woz a long day yesterday. i did convert a dmtr carb to work on my tt xr2, but every time it come on boost it cut out, it woz floodin, i spent a few late nites tryin to sort it wiv no success, so i put my tt tldm back on and it run perfect again, i tryed the dmtr, cos i had one spare and its a bigger carb, in which i didnt think the tldm could get the power, but it woz well up to the job. granted the parts that are there do look in good condition from the pics, but there's nothing there that is really worth a lot aside from the plenum - which at the end of the day can be easily welded up. I also paid Â£50 for everything bar the dizzy module and a downpipe - with a fooked turbo. The real money in these kits is with the TURBO AND MANIFOLD (well designed manifold, proper T25, fits snuggly in an XR2) - i would happily pay Â£200 for a kit like mine was, but KRS did me a favour as i'd been asking for him to sell me it for so long lol!